In Hollywood, we have seen these buddy movies where two diametrically opposite characters team up to give us many reasons for hilarity. Now we have another buddy comedy with an unusual pairing Kumail Nanjiani and Dave Bautista in Stuber. Stuber is a play on the name of the car service, Uber, while Kumail's name is 'Stu'. So, geddit? Kumail is known for his standup comedy routines and his popular role in the TV series, Silicon Valley. Dave Bautista is a former WWE star, who is currently famous for playing Drax in the Marvel Cinematic Universe. So you can expect who is going to play the tough guy and who not. Comedian and Oscar Nominee Kumail Nanjiani to Join Angelina Jolie for Marvel's The Eternals? The first trailer of Stuber shed light on its hilarious premise. 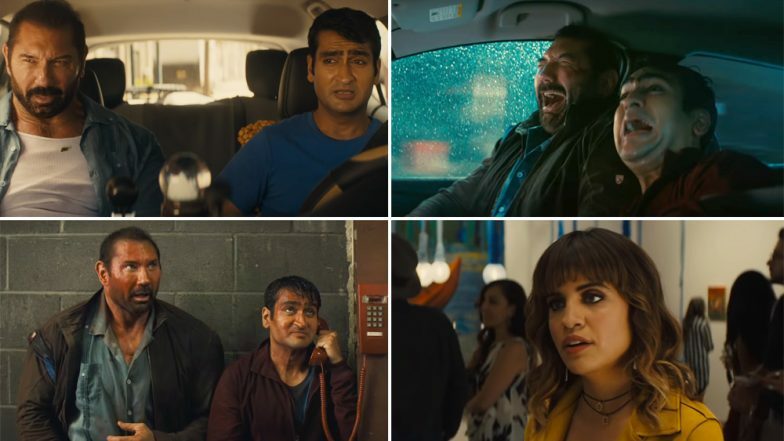 Kumail plays a Uber driver, Stu, who takes on a strange passenger in Bautista's cop. And before you know it, Stu becomes an accomplice, sometimes willing sometimes unwilling, in the cop's crazy mission of taking down bad guys. There are quite a few funny scenes shown in the trailer, though the promo also gives us a vibe of 'been there done that'. Also at times, it feels like an ad for Uber, something films like The Internship (Google) and Ralph Breaks the Internet (Disney) have been accused of. Avengers Endgame Star Dave Bautista Thanks Vin Diesel For Why Drax's Invisibility Scene in Infinity War Works! Stuber is directed by Michael Dowse. Iko Uwais of The Raid fame is reportedly playing the main antagonist, while Stuber also stars Natalie Morales, Betty Gilpin, Jimmy Tatro, Mira Sorvino and Karen Gillan. The movie had its world premiere at South by Southwest on March 13. Stuber will release in July 2019.